I am interested in wildlife ecology, ecosystem management, and human interactions/impacts on both the environment and wildlife. I have had the opportunity to work with crocodilians, pythons and with many other species of reptiles and amphibians throughout South Florida and the Everglades ecosystem. 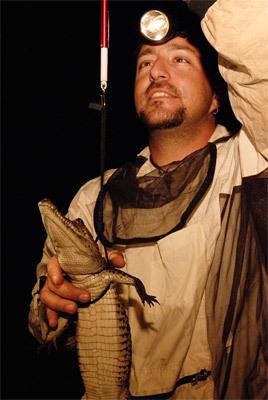 I have also collaborated with government and nongovernment organizations, assisted in the development of crocodile monitoring plans, and conducted training workshops internationally on crocodilian survey and capture techniques within the Caribbean and Central and South America. Crocodilian monitoring and assessment, Burmese python radio telemetry and Everglades invasive reptile and amphibian monitoring program, Sea turtle and Diamondback terrapin research. Smith BJ, Rochford MR, Brien M, Cherkiss MS,Mazzotti FJ, Snow S, Hart KM (submitted) Largest breeding aggregation of Burmese pythons and implication for potential deveolopment of a control tool. Submitted to journal. Pittman SE, Hart KM, Cherkiss MS, Snow RW, Fujisaki I, Smith BJ, Mazzotti FJ, Dorcas ME. 2014. Homing of invasive Burmese pythons is South Florida: evidence for map and compass senses in snakes. Biology Letters 10: 20140040. http://dx.doi.org/10.1098/rsbl.2014.0040. Fujisaki I, Hart KM, Mazzotti FJ, Cherkiss MS, Sartain AR, Jeffery BM, Beachamp JS, Denton M. 2014. Home range and movements of American alligators (Alligator mississippiensis) in an estuary habitat. Animal Biotelemetry 2:8. Rosenblatt AE, Heithaus MR, Mazzotti FJ, Cherkiss MS, Jeffery BM. 2013. Intra-population variation in activity ranges, diel patterns, movement rates, and habitat use of American alligator in a subtropical estuary. Estuarine, Coastal and Shelf Science. 1-9. Green TW, Slone DH, Swain ED, Cherkiss MS, Lohmann M, Mazzotti FJ, Rice KG. 2012. Evauating effects of Everglades restoration on American crocodile populations in south Florida using a spatially-explicit, stage-based population model. Wetlands. DOI 10.1007/s13157-012-0370-0. Mazzotti FJ, Cherkiss MS, Brandt LA, Fujisaki I, Hart K, Jeffery B, McMurry ST, Platt SG, Rainwater T, Vinci J. 2012. Body condition of Morelet’s crocodiles (Crocodylus moreletti) from northern Belize. Journal of Herpetology 46(3):356-362. Krysko KL, Hart KM, Smith BJ, Selby TH, Cherkiss MS, Coutu NT, Reichart RM, Nunez LP, Mazzotti FJ, Snow RW. 2012. Record length, mass, and clutch size in the nonindigenous Burmese python, Python bivittatus Kuhl 1820 (Squamata: Pythonidae), in Florida. IRCF Reptiles and Amphibians 19(4):267-270. Fujisaki I, Mazzotti FJ, Hart KM, Rice KG, Ogurcak D, Rochford M, Jeffery BM, Brandt LA, Cherkiss MS. 2012. Use of alligator hole abundance and occupancy rate as indicators for restoration of human-altered wetland. Ecological Indicators 23:627-633. Mauger LA, Velez E, Cherkiss MS, Brien ML, Boston M, Mazzotti FJ, Spotila JR. 2012. Population assessment of the American crocodile, Crocodylus acutus (Crocodilia: Crocodylidae) on the Pacific coast of Costa Rica. International Journal of Tropical Biology and Conservation 60(4). Fujisaki I, Mazzotti FJ, Dorazoi RM, Rice KG, Cherkiss M, Jeffery B. 2011. Estimating trends in alligator populations from nightlight surveys. Wetlands 31:147-155. Reed R, Hart KH, Rodda G, Mazzotti F, Snow R, Cherkiss M, Rozar R, Goetz S. 2011. A field test of attractant traps for invasive Burmese pythons (Python molurus bivittatus) in southern Florida. Wildlife Research Management and Conservation. 38:114-121. Cherkiss, M.S., S.R. Romanach, and F.J. Mazzotti. 2011. The American crocodile, Crocodylus acutus, in Biscyane Bay. Estuaries and Coasts. DOI 10.1007/s12237-011-9378-6. Snow RW, Wolf AJ, Greeves BW, Cherkiss MS, Hill R, Mazzotti FJ. 2010. Thermoregulation by a brooding Burmese python (Python molurus bivittatus) in Florida. Southeastern Naturalist 9(2):403-405. Rochford M, Krysko KL, Nifong J, Wilkins L, Snow RW, Cherkiss MS. 2010. Python molurus bivittatus (Burmese Python): diet. Herpetological Review 41(1):97. Mazzotti FJ, Cherkiss MS, Hart KM, Snow S, Rochford MR, Dorcas ME, Reed R. 2010. Cold-induced mortality of invasive Burmese pythons in south Florida. Biological Invasions. doi:10.1007/s10530-010- 9797-5. Mazzotti FJ, Best GR, Brandt LA, Cherkiss MS, Jeffery BM, Rice KG. 2009. Alligators and crocodiles as indicators for restoration of Everglades ecosystems. Ecological Indicators 9(6, Supplement 1):S137-149. Beauchamp JS, Cherkiss MS, Rochford MR, Mazzotti FJ. 2009. A recent capture of a large American crocodile (Crocodylus acutus) in Florida. Florida Field Naturalist 37(4):149-150. Brien ML, Cherkiss MS, and Mazzotti FJ. 2008. American crocodile, Crocodylus acutus, mortalities in southern Florida. Florida Field Naturalist 36(3):55-82. Snow RW, Johnson VM, Brien ML, Cherkiss MS, Mazzotti FJ. 2007. Python molurus bivittatus: nesting. Herpetological Review 38(1):93. Snow RW, Brien ML, Cherkiss MS, Wilkins L, and Mazzotti FJ. 2007. Dietary habits of Burmese python, Python molurus bivittatus, from Everglades National Park, Florida. British Herpetological Bulletin 101:5- 7. Mazzotti FJ, Cherkiss MS, Parry MW, and Rice KG. 2007. Recent nesting of the American crocodile (Crocodylus acutus) in Everglades National Park, Florida USA. Herpetological Review 38(3):285-289. Mazzotti FJ, Brandt LA, Moler P, Cherkiss MS. 2007. American crocodile (Crocodylus acutus) in Florida: recommendations for endangered species recovery and ecosystem restoration. Journal of Herpetology 41(1):122-132. Cherkiss MS, Parry M, Mazzotti FJ. 2007. Crocodylus acutus (American crocodile): migration. Herpetological Review:38(1):72-73. Brien ML, Cherkiss MS, Johnson VM, Mazzotti FJ, Snow RW. 2007. Python molurus bivittatus: clutch size. Herpetological Review:38(3):342. Cherkiss MS, Mazzotti FJ, Rice KG. 2006. Effects of shoreline vegetation on visibility of crocodiles during spotlight surveys. Herpetological Review 37(1):37-40. Cherkiss MS, Bass OS, Mazzotti FJ. 2006. Crocodylus acutus: geographic distribution. Herpetological Review 37(4):491. Moller MP, Cherkiss MS, Mazzotti FJ. 2000. Cocodrilo Americano (Crocodylus acutus): los avances de la recuperacion de una especie amenazada [American crocodile (Crocodylus acutus): advances in the recovery of an endangered species]. Fort Lauderdale (FL): University of Florida Institute of Food and Agricultural Sciences. Moller MP, Cherkiss MS, Mazzotti FJ. 2000. American crocodile (Crocodylus acutus): an endangered species recovery in progress. Fort Lauderdale (FL): University of Florida Institute of Food and Agricultural Sciences.